EO Products makes a number of Certified Organic products. One of them is their Certified Organic Lavender Deodorant Spray. This spray is very effective, it contains organic Ethanol that eliminates odor at its source. The timeless scent of Lavender lends this deodorant its beautiful scent, keeping you fresh, clean and calm. That is what I love about Lavender, it has such a wonderful calming effect. The deodorant does not have any aluminum salts, propylene glycol or zinc salts that can clog pores and toxify the system. Stay fresh, organically. It comes in a 4 fl.oz. recycled blue bottle. 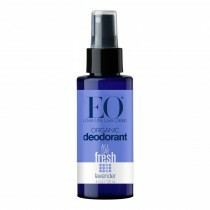 Take the EO 30-Day Deodorant Detox Challenge! Give your body a break from synthetic scents and other hard to pronounce ingredients found in mainstream deodorants and antiperspirants. This year take the EO 30-Day Deodorant Detox Challenge and make the switch to Organic Deodorant in 2017! Click on the link to read more about the challenge and what to expect as your body makes the transition to organic deodorant. Usually you will find that as your body transitions from regular deodorant/antiperspirant your body odor will actually increase. This may happen for up to 30 days. The cause of body odor is bacteria. When we sweat, the bacteria living on our skin breaks the moisture down into acids and can result in unpleasant odor. An article from Medical News Today discusses the source of body odor. It’s important to remember this when choosing your natural deodorant. An ingredient like alcohol, the main ingredient in EO Deodorant Sprays and Wipes, is effective against the main source of body odor: bacteria. One study conducted by Ghent University found that antiperspirants actually increased the amount of bacteria present on underarm skin. It’s no wonder why the process of making the switch from conventional to natural underarm products can cause so much disruption to our personal hygiene. It's much easier to tackle body odor effectively once you understand what’s causing it. Body odor can be affected by stress, hormones, diet, and exercise. Being mindful about what you eat and drink will go a long way to help reduce body odor. Some studies have explored how the things you eat can affect the way you smell. Here’s a great article written by Berkeley Wellness that covers the top odor-causing foods you should avoid during your detox. As always, drink lots of water. An active body is a healthy body. When you are active, the body sweats to cool you down and helps to release toxins. Being mindful of how often you’re active will help speed up the detox process. Natural deodorants work to control body odor, not to stop your body’s natural functions. Remember, sweat is a good thing! Start with Deodorant Spray. This may be a new deodorant experience for you. The main ingredient is Organic Alcohol derived from Sugar Cane. Alcohol is effective against bacteria, the source of body odor. Here’s a tip: If you shave your underarms, it’s best to do so before bed and wait to apply deodorant in the morning. The alcohol can cause irritation on freshly shaved skin, so remember to give your skin the chance to calm down overnight between applications. Keep the wipes with you! The Deodorant Wipes are made with the same formula as their Deodorant Sprays, but are individually wrapped and ready to go anywhere you might need a little backup. Let’s face it, detox is stressful. This extra stress can actually increase your body odor, so they're here to bring you a little relaxation. A hot bubbly bath with some sea salts will help to calm your nerves, open your pores, and soothe your mind and body. One way they can help restore balance to your delicate underarms is using a detoxifying clay mask. We’ve added our Moroccan Lava Clay so you can be good to your skin while it transitions between underarm products. This masque will help loosen dead skin cells and release impurities. Take the challenge! Join EO Products on social media and let them know how it’s going for you. They will be posting on Instagram and Facebook as the challenge progresses, sharing stories, successes, and pitfalls. I decided to take the 30-day challenge myself. I used this product instead of any other regular deodorant or antiperspirant for 30 days. I did notice that my body odor increased at first. But after a little while, it started to go back to normal. This does help to work on the bacteria that are on the skin, killing the odor. Unfortunately deodorants like this do nothing for perspiration. I am seriously waiting until they can find an Organic way to help with perspiration. I don't perspire that much but it's enough that I would like help with it. I love the smell of the lavender, it is so calming. It's almost like having some Xanax on my underarms. EO Products are available online at www.eoproducts.com. Like EO Products on Facebook: https://www.facebook.com/EOProducts; Follow EO Products on Twitter:@EOProducts; Follow EO Products on Pinterest:https://www.pinterest.com/eoproducts/ and Follow EO Products on Instagram:https://www.instagram.com/eoproducts/.